Over the years I have been abundantly blessed with friends who have inspired me, encouraged me and brought great joy and insight to enrich my life. In this section of my website I would like to share with you the role that specific individuals have played in leading me to where I now stand with open arms to receive God’s many blessings. The first friends I will tell you about are the Tylers, Henry and Elsie, a lovely English couple who lived in Ceylon, Ontario, where I was raised. They had one son, Henry, whom they adored. When I was a young child, their son had already grown to manhood and was married to a wonderful woman named Shirley. They lived some distance away with two children, Julie and Billy. These very attractive grandchildren of Mr. and Mrs. Tyler would make frequent visits to Ceylon where they were popular with all the local children. 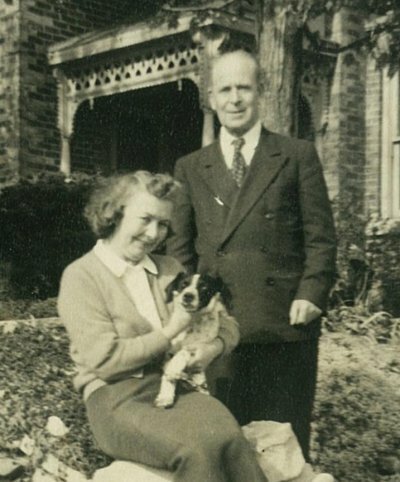 In the accompanying picture, the Tylers are standing in front of their home which had earlier belonged to Agnes Macphail, Canada’s first female member of parliament. In this charming house my mother had worked for Agnes as a housekeeper, a caregiver for Agnes’ mother, and a cook for all the political dignitaries who would come to visit. Thoughts of the Tylers are among my sweetest remembrances of childhood. This dear couple were like grandparents to me. They were inseparable and I have many memories of them walking hand-in-hand through the village. Mrs. Tyler kept a beautiful rock garden that we would admire on our walks to school. One day, as I passed by, Mrs. Tyler asked me if I had ever had lessons in deportment because she admired how I carried myself. I had no idea what deportment was, but somehow I must have been born with a certain distinctive carriage because others, too, have remarked upon this attribute. I think my posture might have more to do with the fact that my thoughts are often in the clouds, so I am continually reaching upwards! When Mrs. Tyler passed away, my friendship with Mr. Tyler continued to grow, nourished by the depth of the conversations we enjoyed during the many visits I would make to his home. Mr. Tyler was my father’s accountant and I remember him telling me once that my father was “strictly honest”. I am deeply grateful to both my parents for instilling this value in each of their children. Mr. Tyler loved literature and would share with me many of his favourite quotations, such as the two included on this page. He recognized my interest in writing and was always eager to hear details of any new creations. It was a great sadness to me whenever this dear friend became ill and eventually passed away. These words I have carried with me in my heart for 35 years. I had been so overjoyed to hear Mr. Tyler speak this pronouncement because I knew that at some level he did recognize that day who I was and this thought made it easier to part with my friend. Was “Water From The Moon” the book Mr. Tyler seemed to see in a vision? I’m not sure yet, but I feel his guardian spirit walking with me still and I’m so grateful for having had the privilege of his friendship in this world. I hope this page of my website causes you, too, to reflect on your great good fortune in meeting people who have positively influenced your life. Letting people know how much we appreciate them can sometimes be the message we all need to hear.